Moroso Vacuum Pump - Lesher Motorsports, Inc. The nature of a vacuum pump is to remove air, blow-by gasses and other contaminants from the crankcase of an engine. The vacuum pumps ability to remove the air in the crankcase results in overall engine vacuum. Vacuum will increase horsepower by allowing the use of low-tension compression and oil control rings. In which the use of reduces frictional horsepower losses, blow-by, intake charge contamination and aids in detonation prevention. 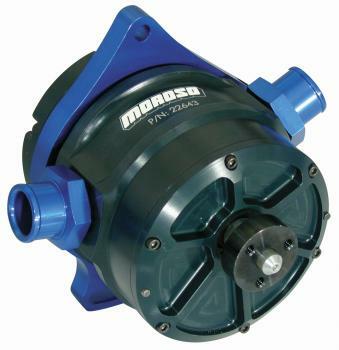 Moroso’s “purpose built” racing pumps offer all these advantages and more. Whether you have a normally aspirated Small Block or a nitrous equipped Pro-Mod, one of Moroso’s five vacuum pump offerings with all the needed accessories have you covered. These pumps will suit nearly any engine combination and requirement. Moroso offers Anodized Billet Aluminum Vacuum Pump Mounting Brackets that fit a variety of engine and vacuum pump combinations. These brackets fit the engines directly or mount to a motor plate. Refer to the listings.